This November, as in years past, the youth of West Valley will assemble and distribute Thanksgiving Baskets full of food to a dozen families of need in our community (names are provided by West Valley Community Services). 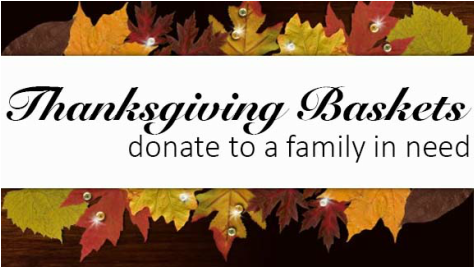 The baskets, which consist of traditional Thanksgiving items as well as everyday groceries will be put together and distributed the Saturday before Thanksgiving - November 18th. The youth cannot do this alone and need your help. Starting Sunday, October 22nd the youth will be collecting canned and non-perishable foods in the church lobby. If you wish to make a financial donation, you can place your donation in the offering plate or leave it with Veronica Cruz in the church office. Questions? Contact Veronica Cruz in the church office.